In the drought stricken areas people are being forced to sell their cows, calves and bulls. Pairs are being split up at the sale barns…calves going one way, some cows getting a chance to continue to be cows, some cows becoming processed as commodities, bulls being processed…some cows get to remain at home for a while. And, in the spirit of beating a person when they are down, those folks with some of the worst quality/weedy hay are shipping it to the people for about 4x the price. That’s right folks…just add insult to injury. And when you break your normal contracts with your regular hay customers because you are now selling hay for 4x the money…just remember who helped you over the past years when you couldn’t give your hay away. It is shameful how people are…just my opinion. April 20, 2008. It’s raining. It’s been a rainy spring, lots of mud, lots of work and every work day is miserable. 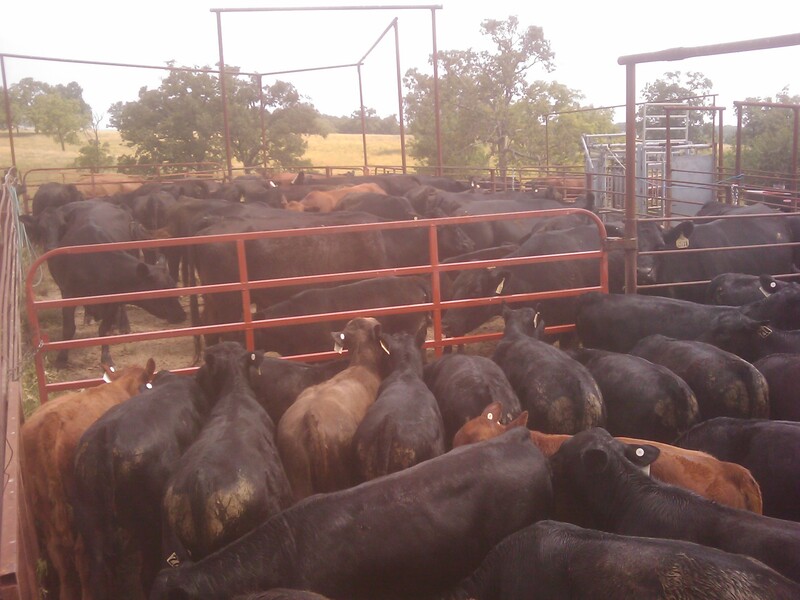 But, the cowdogs and I have to get some calves in, sorted and penned because the trucks will be here in the morning. I have Ducchess, Bert and Hawk moving some heifers that we sorted to take to a pasture. 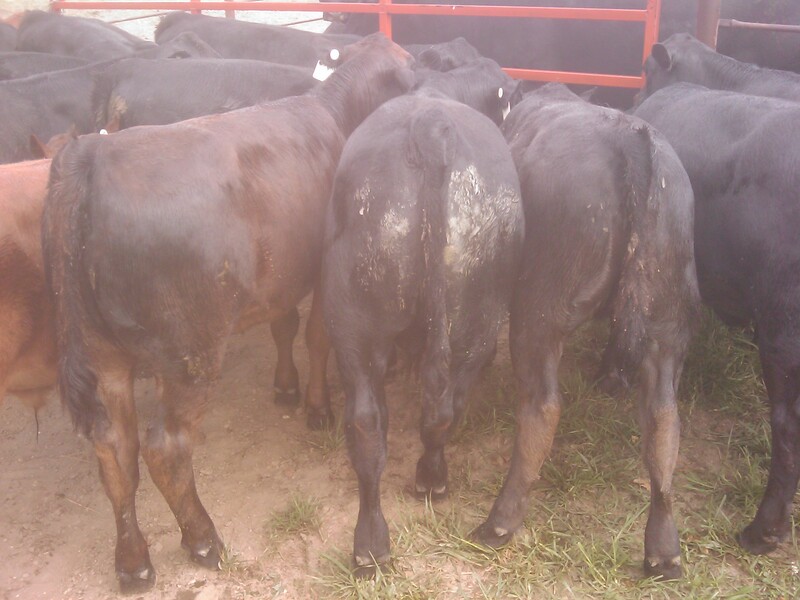 The calves break to run back out the gate and I issue to Bert and Ducchess….get ahead, get ahead, get ahead. Bert and Ducchess are headed down the fenceline. Just as Bert gets ready to pass up Ducchess, she bites a heifer in the hip. The heifer gives a sideways kick and nails Bert in the left hind leg. He screams, goes down, gets back up and takes back off to the head of the cattle. I call out, “Bert, that’ll do, that’ll do.” He stops and he’s in horrible pain and his leg is broken. I call off the work and pick up Bert and lay him in my ole red ranch pickup. I take Ducchess and Hawk to the house. Bert and I are off to the vet in a ‘toot’. The vet has been called and they are going to meet me at the door to carry Bert in. On the way to the vet Ole Red begins to ping and knock and smell hot. I tell Bert, “Just hold on, if OLe Red goes down, I’ll get you there come hell or high water.” We get to the vet and Brian comments, “My God, Red is burning up!” I reply, “Let ‘im burn.” Bottom line…motor had a bearing go out. So we called a friend to tow us home once we got Bert’s leg casted. Ole Red sat by the shop for 3 years. But this past March I thought I’d just go ahead and fix him up. A couple days ago Ole Red was back at home. It was a really sad moment though. 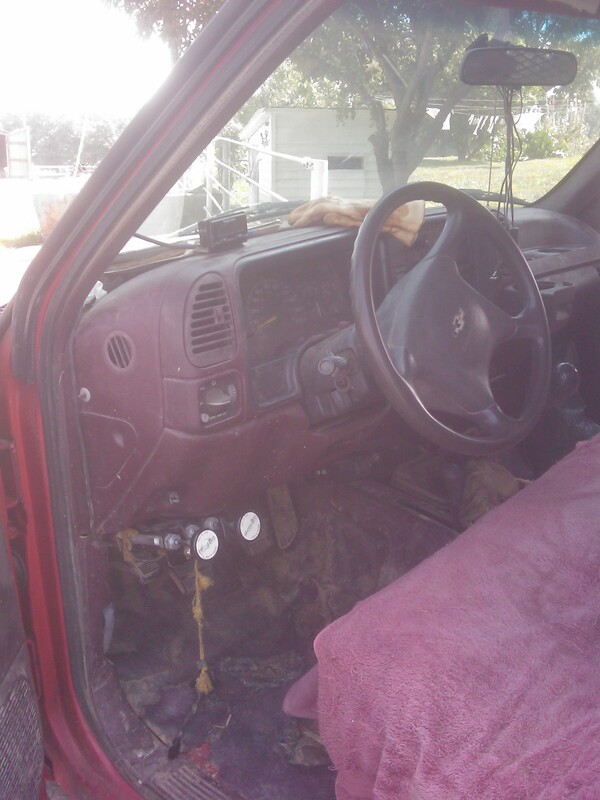 The pickup looks the same inside as when I drove Bert to the vet to cast his leg. Still has his spit spots all over the passenger side of the dash and window. He loved that old pickup. I brought him home at 6 weeks of age and that pickup became his daily home. Riding in my lap. Looking out the window. Learning new words everyday. Bert seldom rode on the back. But when he did he rode right behind me. He always yielded his head to me when I said, “Give me your collar.” I always kept him chained to the rack. When it was summer, he’d hold his mouth open and make the funniest faces. He loved the wind blowing in his mouth to make the funniest sounds. He’d just look at me and smile when I’d tell him to get your head back in here. He loved looking out the window into the mirror. I don’t think it was to look at himself, he just had a thing of watching the road behind us. I could go on forever about how fun he was, how smart he was, and how much I loved him. 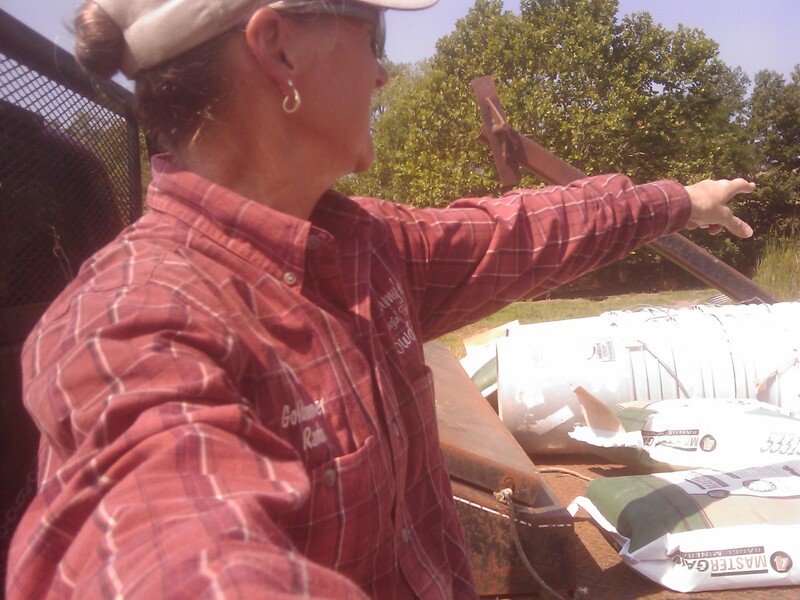 But today, I got up the nerve to load Ole Red up to put out mineral and some grain in the weaning traps. Hawk rode in front like she always did. Bandit took Bert’s place behind me. Levi got the middle and Ducchess rode in her old place. 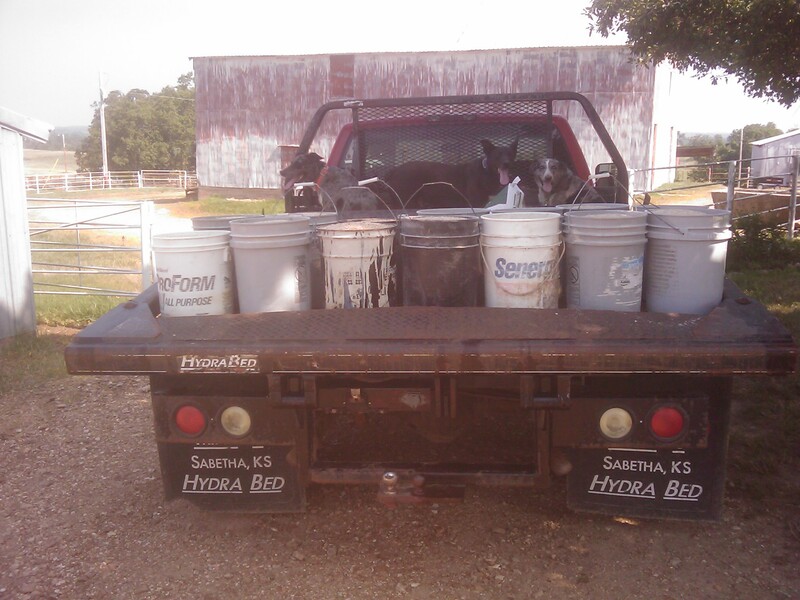 Ole Red is a typical ranch rig. Lots of classy features and customized works of art. 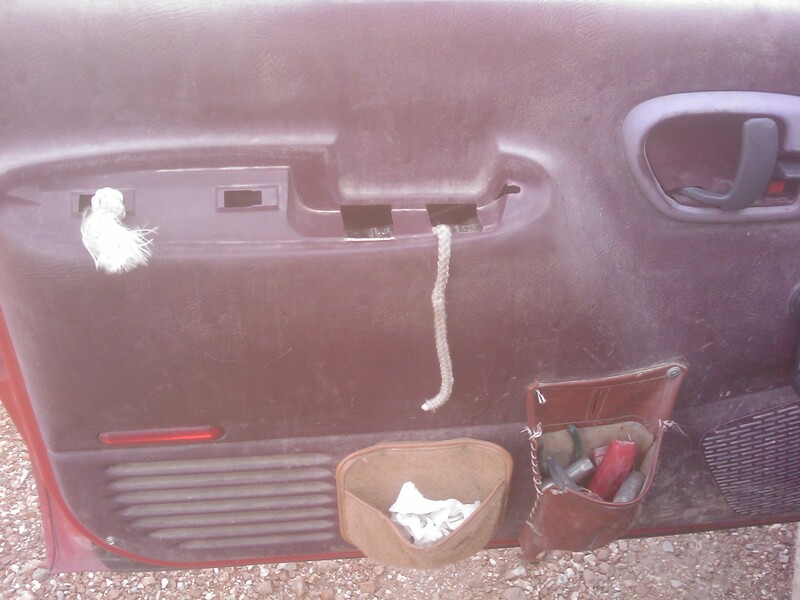 To commemorate Ole Red’s return to the ranch we snapped a few pictures. It was so hot and hazy the pictures are fuzzy. He runs good. We made the rounds and parked him back in his old familiar spot. I guess it is a ‘milestone’ of sorts. Kinda sad writing about all this too. Bert and I spent a lot of days and nights in Ole Red. Walked home a few times when we got stranded somewhere. Lots of memories in that ole pickup. One of my neighbors was so excited to see Ole Red he followed us to the Windmill pasture. He insisted we get some pictures to have as a keepsake. I asked him if he wanted to ride around to make the rest of the rounds. He laughed like a Santa and said, “Lord no. Look at you, you are soaking wet from sweat. I’m heading back to the house!” We visited a bit and he went on back home. He too loved ole Bert. 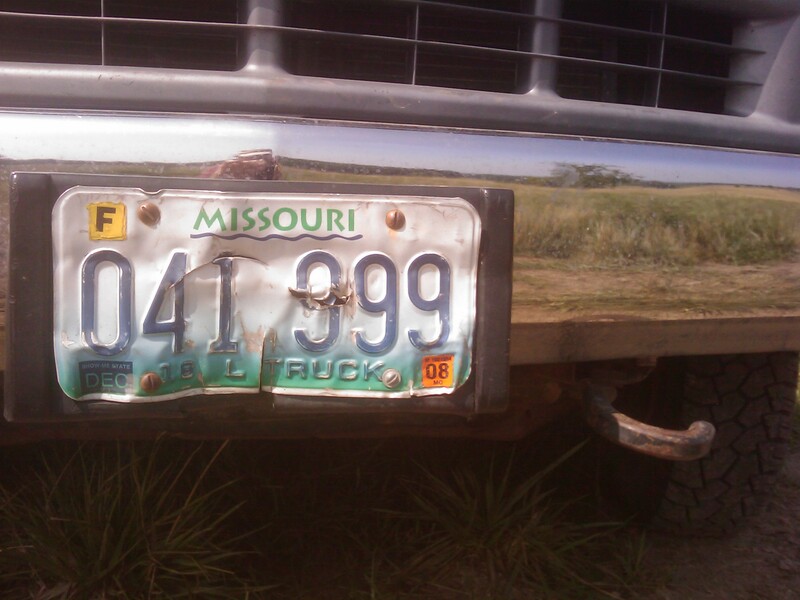 Ole Red’s license plate was unique too. 041-999. I was ’41’ in 1999 and it just happened to be the plate that I got when it was time to renew the plates. It was one of those rare ‘who knew’ moments in life. The cowdogs and I continued our mission this morning of declaring war on flies on cattle. It was a breathtaking morning to say the least. It was horrible…hazy, hot, and humid. The great thing about today’s work was it was in one location. 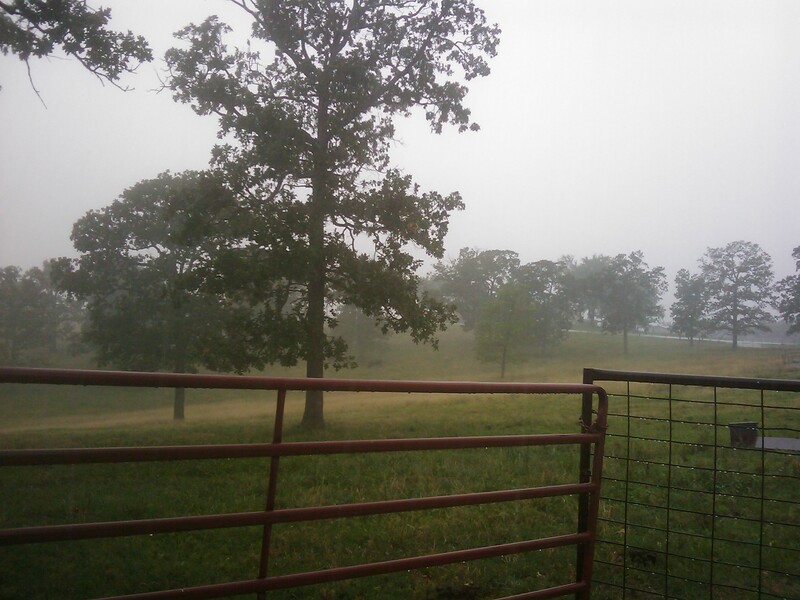 Two separate pastures to round-up with a corral system built in the middle. Since it was so hot I took two cowdogs that have gathered here before. Wooded hills and a branch through the middle. There is a lot of satisfaction in having some experienced cowdogs that can go out, hunt, find, gather, put the cattle into a group and head them to the corral. I stayed at the corral to set things up. It took the cowdogs about 45 minutes to cover the hills, drive the cattle to the branch and about 10 minutes to bring the group up the hill to the pens. I am so blessed to have had a cowdog like Bert. His matings with Hawk have created some great cowdogs. Very business minded, cowwy, gritty when needed and good at adapting to the work sites and chores at each location. When Bert and I put together this particular work area it was nothing more than a few portable panels. We had to learn to work in an orderly, methodical way to get things done. Getting things done also included not creating extra work because of nonsense from cowdogs, cattle and people clashing and crashing the whole operation. It was really amazing to watch the couple of times that Bert got to work at this location after we built some permanent facilities last spring. He worked as if to say, “Wow, this is really a lot easier for all of us.” I layed it out to be cowdog friendly and with the purpose of making it accessible and easy for the cowdogs to get around and with common sense in the traffic pattern for the cattle. 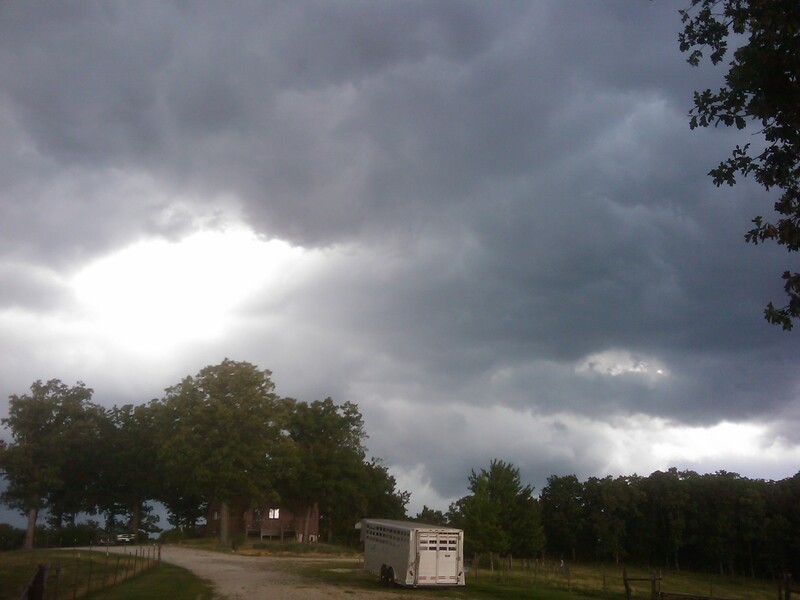 The last day Bert was with me we had to haul calves out of there with the trailer hooked to the tractor because it had been raining and it was difficult to get in and out with a pickup and loaded trailer. In a lot of ways, today was a very sad day to say the least. But Hawk and Ducchess did a great job. I sent them to hunt, find, gather and bring the cattle to the pens and they did exactly what I asked and in the order that I asked. What more could a person ask for? They did a great job at the pens with the sorting and went to get a drink when I told them to take a break. 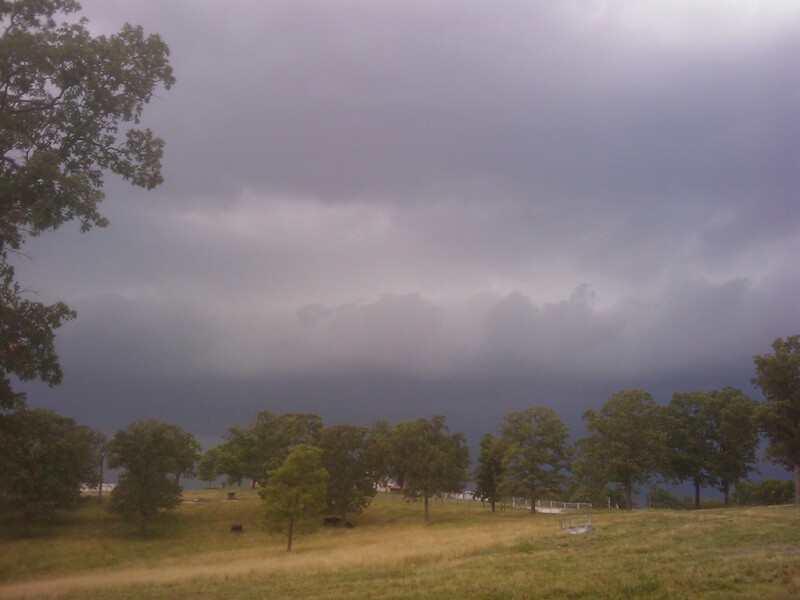 Even today’s pictures will remind me of the muggy, hot job. The pictures seem hazy or out of focus…but it was the thickness of the air. I can remember back in February in the depths of 48 inches of snow, “I’ll want this cold air and snow come July.” Well, guess what, I sure could use a snow drift about now! It’s been just shy of 30 days since the cowdogs and I poured all the cattle for the spring deworming and fly control. And, the face flies have made a devastating dint in some of my spring pairs. In the last 5 days we have gone from no watering eyes to a major outbreak of watering. We never have pinkeye…but we got it now! It must be a different strain of bacteria. The cattle eyes go from barely watering on day 1 to nearly opaque by day 2. It’s been dry, dusty and extremely hot and humid so that cattle are hold up in shaded branches and just making mud pits everywhere. The cattle get caked in mud and it makes it even worse for them to cool down and every day is just a repeat of the day before. So it just makes it worse. I’ve never been behind the 8 ball like this. So, the mission today was to change the fly treatment. 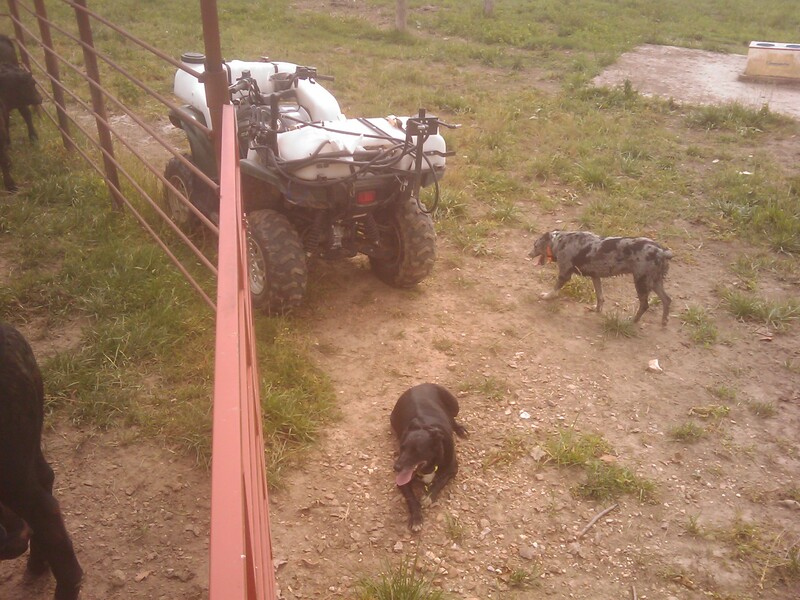 Now that I got my spray rig all doctored back to health the cowdogs and I began the mission of spraying everything. We started out early this morning and by noon we had done a couple hundred head. Which was pretty good considering we gathered from a few different places, had some sorting to do, sprayed and returned the cattle to their pastures. And, by noon it was pretty hot and the sun was intense. By 3:30 p.m. we got all geared up to take another crack at gathering, sorting and spraying more cattle. We worked with the path of the sun so the afternoon groups would have traveled closer to the corrals simply because they were moving away from the sun and closer to water. Since it was still really hot it made the gathering distances shorter for the cowdogs by working with the cattle’s daily travel routine. The last two groups of the day we didn’t have the luxury of cattle being closer to the corrals. So I decided to get some fresh legs. Hawk made all the journeys today but my the last two groups she was traveling slower. She let her kids to the heavy duty work and she was the ‘reader’ and great assistant when we got close to the corrals. 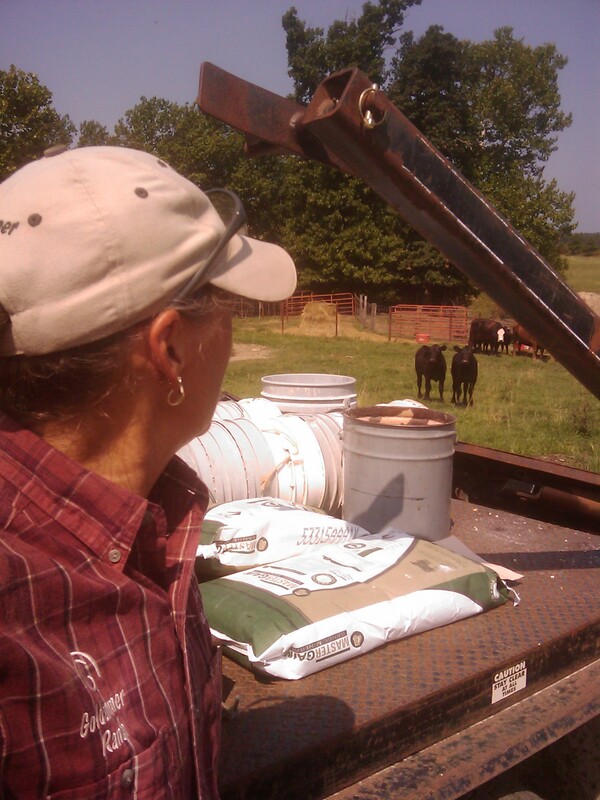 She and Bert have given me some great partners for cattle work. They are all-around great help and really good friends. We were coming up out of one pasture and it dawned on me that I should have been trying to shoot a bit of video footage. 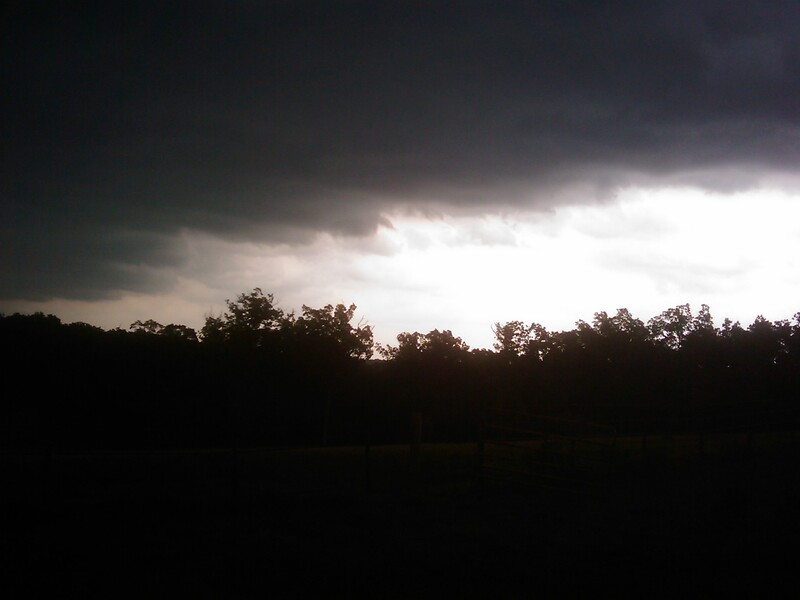 So, I quickly fumbled around to get my phone to set it to video and by that time the cowdogs and cattle had passed me! I shot a little clip and will see if I can post it to play here on my blog. 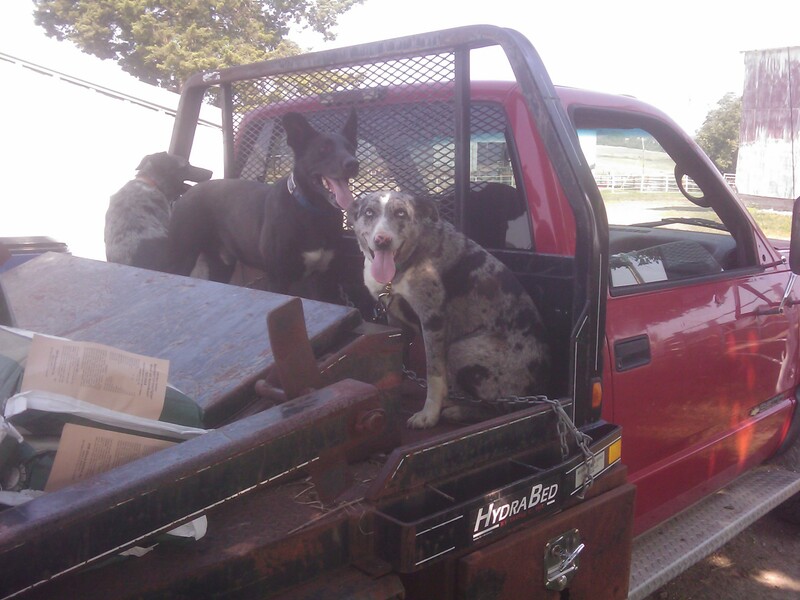 The cowdogs in the video are Ducchess (blue merle female) and Hawk her mom. We started about 3/4 mile from the corrals down in a patch of cedar trees along a branch. The last 1/2 mile was out in the sun heading up the hill to the lot. The last week of June and first few days of July have been a scorcher. 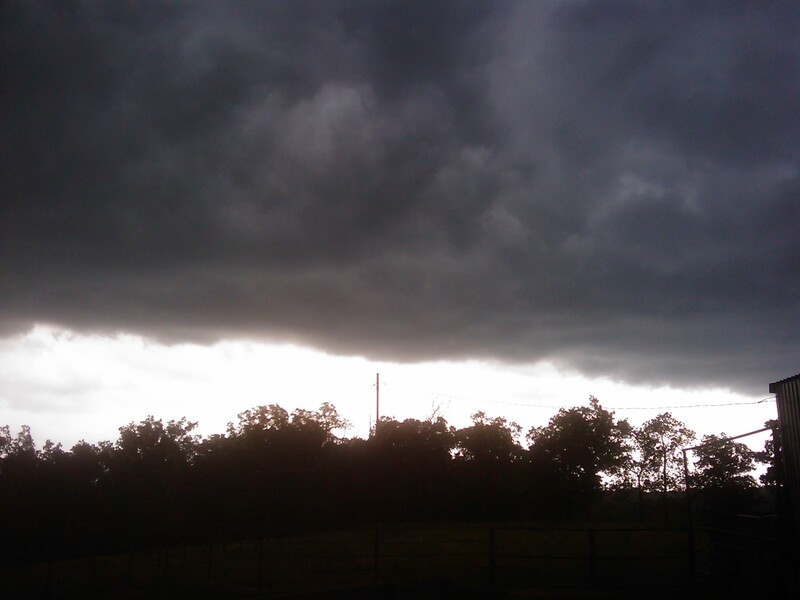 There was a remote chance of rain for Sunday afternoon…a 10% chance. 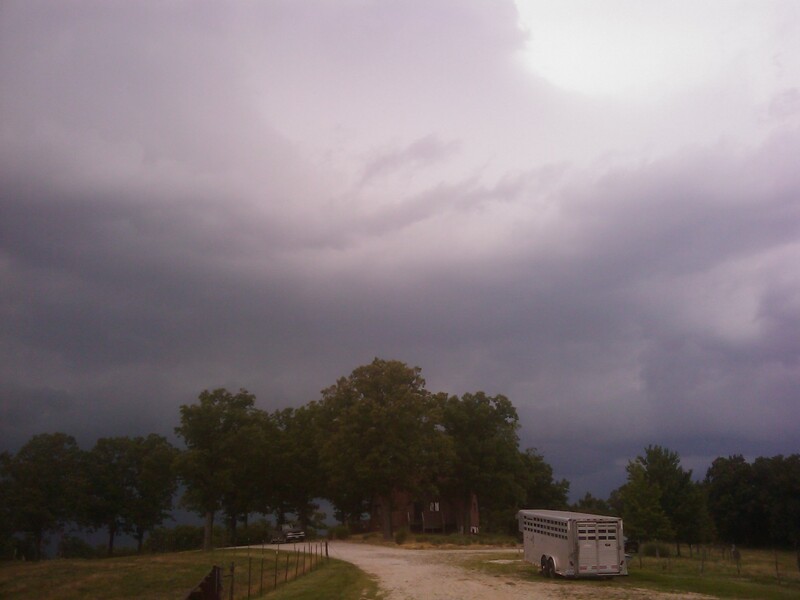 The forecast kept the bulk of the possibilities of rain to our N and E. It’s been hot enough that cattle work has been limited to really early or really late in the day. A few cases of pinkeye have shown up…mostly driven by being dusty and dry, then carried along by some face flies. 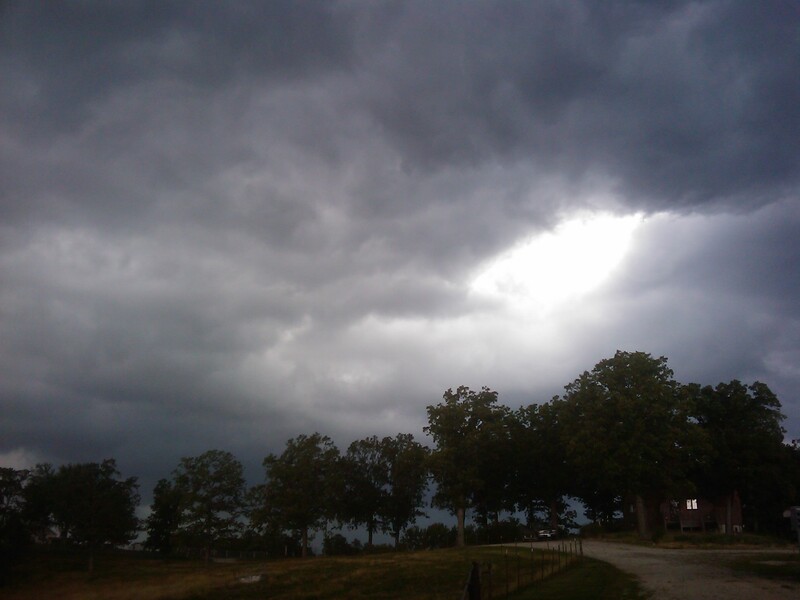 Around 3 p.m. Sunday afternoon it appeared that the dark skies would continue to go N and E around us. 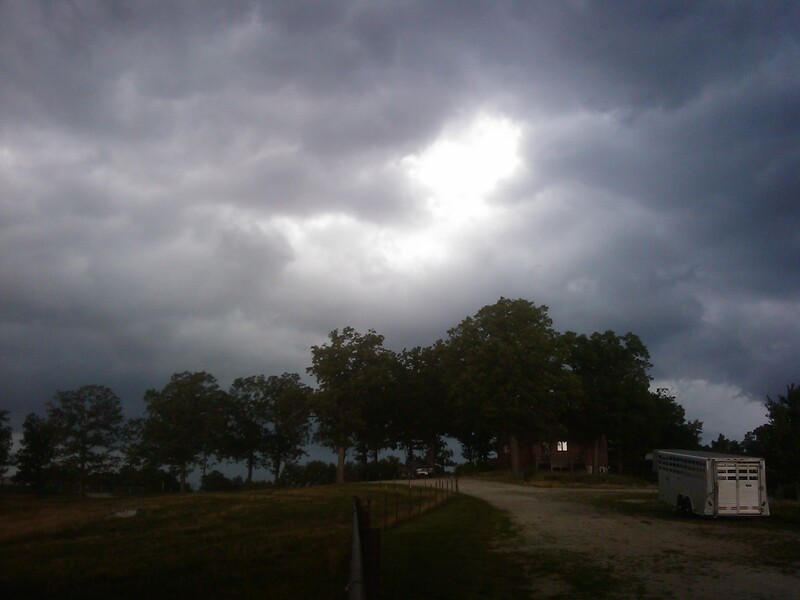 But, we got lucky and got a whiff of rain…while only a 1/10th, it was welcomed. 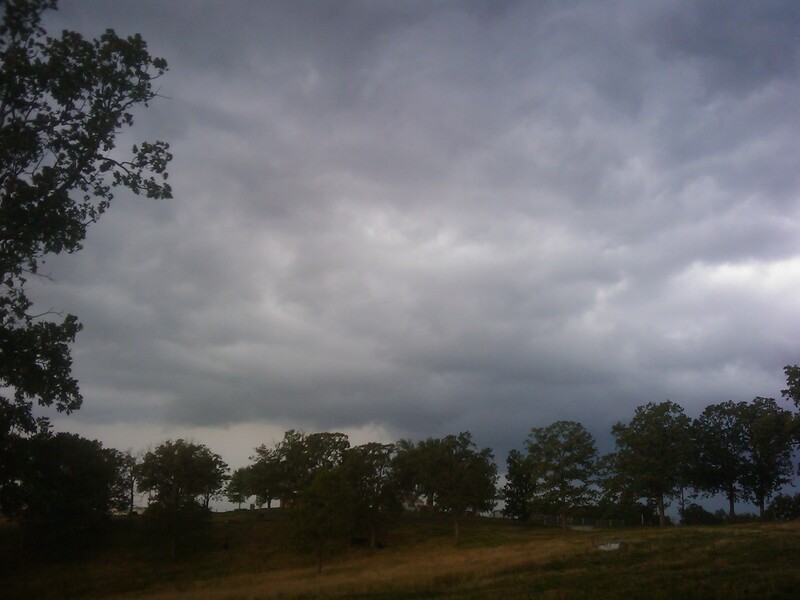 Even the few pings of hail sounded good…it cooled off the air. It was a welcomed relief! A ranch in Texas is searching for pasture and care for 450 fall calving cows. The cows do not have to stay as a group of 450 head. If you know of anyone that has grass to lease or rent in any area of the USA, please send me an email message with the name and contact information. I will forward it on to the ranch.